Bike patrol can be a serious job. We're here to make sure that doesn't happen. I picked A - it shows your skills in acting, your faces so expressive and, knowing the concept of the show, makes this poster so funny, enjoyable. Great quality poster, I like everything in it! Congratulations, I'm so glad to see you guys in top 55! Way to go, see you in top 15! Someone needs to protect this city. Thanks to Joshua Hyman for the graphic design. There's no escaping the short shorts of the law. Thanks to Joshua Hyman for the graphic design. Very strong visuals on both. I love the simplicity of B, but A is more eye catching and tells a stronger story. Great work all around! I'm loving the look of poster A & my vote goes to A, if only "there's no escaping the short shorts of the law" was on it. I'd vote twice! 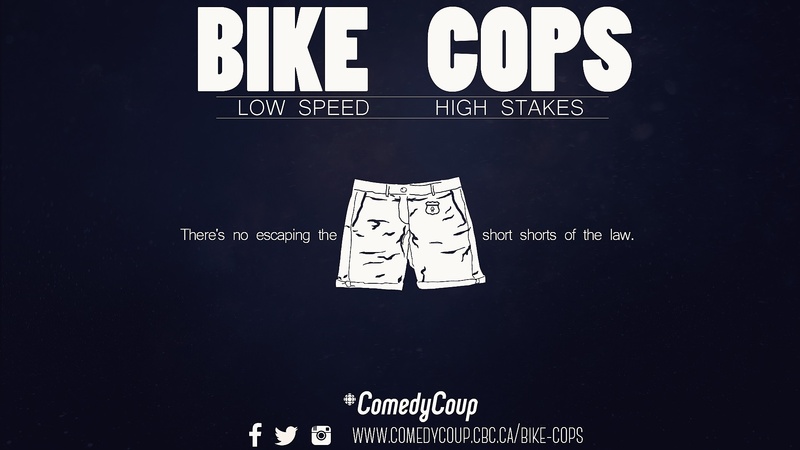 "there's not escaping the short shorts of the law" LMAO ain't that the truth! Love both of these posters but voted for A because it felt more "TV". I think B would make a great print ad campaign! Well done on the Pro's pick. They weren't wrong. The Tag line is brilliant. And you have a great brand consistency between your missions on your cover art. congrats on pros pick! your poster a really stands out and it is very original. I will sleep better tonight knowing Bike Cops are officially Pros. Canadian Comedy is in safer hands. Congrats to The Force for being chosen Pro Pick! Fabulous!!! You so deserve to be the big pick. Keep it coming. Thanks so much Bogdan. It's awesome that you picked up on the story and concept represented in poster A, that's what we were going for! We're very excited to see you in the Top 15 too! Love A, it made me want to check out the videos again. I guess I like seeing the casts (especially when they're diverse!). Comedy=diversity! We have such an amazing cast, so we had to show them off in our poster. Thanks for watching and commenting Erin! I had to vote for Poster B...congratulations Joshua I think it's a winner!! Thanks George! Joshua did an amazing job, and on a ridiculously tight schedule! It was great working with him. Why Ted, your eyes are so electric. Didn't know Bike Cops also had super powers! As always we j'adore everything you boys do! Team Charlie & Yoni. Poster A is better. Now I'm a poster poster. If the cbc has comment trolls the bike cops will serve and protect me. Right after they ticket me for texting and cycling. Watch out for that....tree. both posters were great but i prefer A. Nice work on making the cut for the top 55, had to go with the short shorts one on this one, made me laugh, its nice and simple but funny as well!!!!! Excellent posters, this was a hard choice. I love the simplicity of poster B, but in the end poster A won me over since it genuinely looks like a movie poster to me. The only thing that was weird for me in poster A is that your blue eyed biker guy has a lot of white showing with his eyes like that, reminds me a bit of those supernatural movies where someones eyes go all white. (By the way, thanks for replying to my previous comment, I appreciate that you guys also take the time to read what fans have to say). B is such a great tag line. poster A is so good. imagining the show with lots of explosions is making me happy. Officers, I turn myself in. 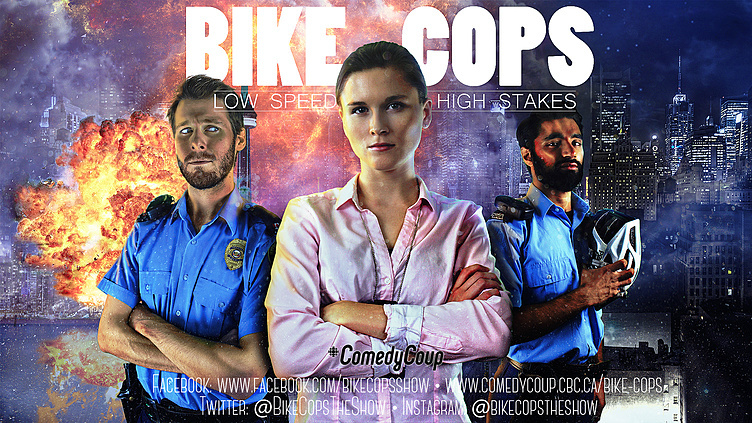 I am addicted to Bike Cops. Can't wait for my next fix!